As connected, what you want for your unique individuality also serves the Whole tree, all leaves. Your view may be north and another leaf to the south, why would these different views be taken as the leaves being disconnected, or separate? How could you treat any other leaf as not part of yourself when you are One tree? How would this mistreatment not be seen as mistreating the Whole tree and you? 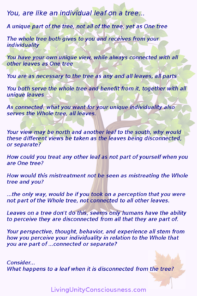 …the only way, would be if you took on a perception that you were not part of the Whole tree, not connected to all other leaves. Leaves on a tree don’t do this, seems only humans have the ability to perceive they are disconnected from all that they are part of. Your perspective, thought, behavior, and experience all stem from how you perceive your individuality in relation to the Whole that you are part of …connected or separate? 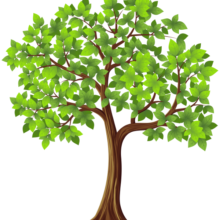 Consider… What happens to a leaf when it is disconnected from the tree?